What is the best type of swimming lesson for you? One to one, two to one or group lessons? 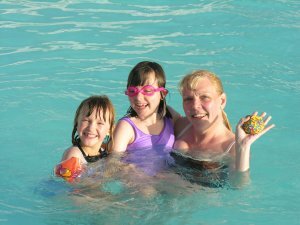 There are many worries for a parent when seeking swimming lessons – will my child(ren) be upset, what if they do not like the teacher…! A key dynamic to seeking lessons is whether to have a group, one to one or two to one lesson type. The answer is multifaceted, however here are a few points to consider (for and against) each session. Please note, these are generic points, what may be listed as a con here may be a pro for you – vice versa. Can be used as a short term fast track if a swimmer has in groups.